Every Blockchain platform is powered by tokens, sometimes also referred to as “coins.” Bitcoin is a token, so are Litecoin, Dash, and other currencies that function over a Blockchain. While tokens can represent money, as in the case of the above, they can also represent other things. drives demand for that particular token which in-turn usually the determines its value and eventual market price of its token. This is why there is a variation in the prices of different altcoins in the Blockchain environment. For example, Bitcoin is more readily accepted by merchants than Litecoin, and is consequently more valuable. Ethereum’s value is largely ramped up by the demand for its platform by distributed application (dApp) developers. 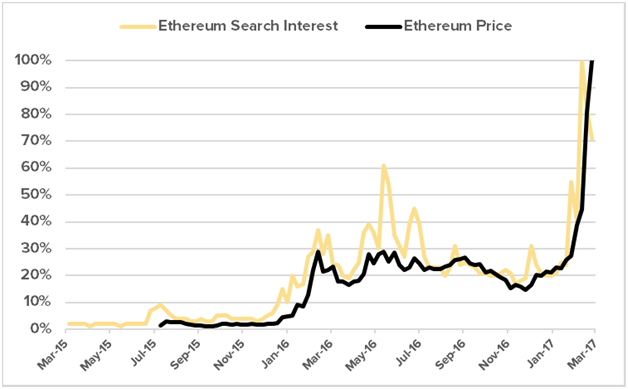 Circa 2017, many of these developers issue tokens to grant access to their services, essentially building their own Blockchains atop Ethereum’s platform which drove up the price of Ethereum. In many cases, developers pre-sale their tokens as part of an initial coin offering (ICO), and they usually accept Ethereum token “ether” as payment. When Satoshi Nakamoto published the Bitcoin whitepaper it wasn’t that the underlying tech to build the blockchain did not exist. The genius of Bitcoin was that it combined cryptography, networking theory, computer science and economic incentives to build the bitcoin blockchain. For Bitcoin to be accepted globally it needed to have a big enough user base of acceptance. Because the supply of Bitcoin is limited, as demand goes up, so does the value. This gave early adopters of bitcoin both the incentive to invest in bitcoin and also the incentive to use bitcoin. The tokenization of Bitcoin using blockchain is what helped bitcoin solve for the classic ‘chicken and egg’ problem which every network faces at the start. Because of this, early adapters got value from the network and the network benefited from these initial users. This now creates a new business model for entrepreneurs to build companies. Raising money from third parties like venture funds, angel investors, etc is no longer required. Business can now raise money directly from there initial set of user and the users have their incentives aligned to use and grow the platform. Sia is decentralized storage platform. Users all over the world contribute disk storage from their computers to form a decentralized network. Users use Siacoins to rent storage from hosts on Sia.